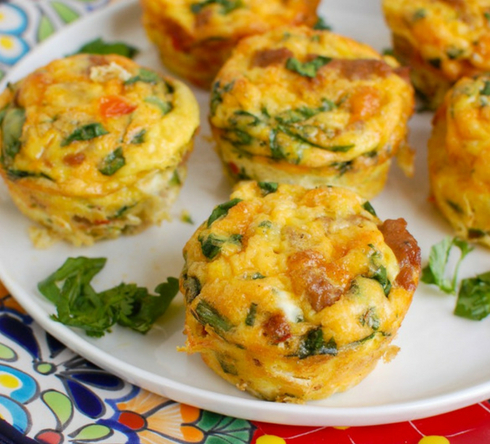 Southwestern Turkey Sausage Egg Cups by Ohio food blogger A Cedar Spoon are a protein-packed make-ahead breakfast that is perfect for weekday mornings. Eggs are mixed together with turkey sausage, spinach, bell peppers, warm spices and cheese to create a flavorful egg muffin. Top with salsa and cilantro and enjoy! Preheat the oven to 375 degrees. Grease your muffin tins (enough for 12-18 muffins, depending on how big you want them) and set aside. In a large skillet, head 2 tablespoons of olive oil over medium heat. Add the turkey sausage, taco seasoning and cayenne pepper, and cook for 3 minutes. Add the bell pepper and onion, and continue to cook until turkey sausage is browned, about 5-6 minutes. In a large mixing bowl, put the turkey sausage mixture, spinach, green onions and 1 cup of cheese. In a different mixing bowl, crack the 12 eggs and whisk them together. Pour the egg mixture into the turkey sausage mixture and season with a dash of salt and pepper. Stir until fully combined. Pour the egg mixture evenly into the muffin tins (about 3/4 of the way full or they will spill over) and sprinkle each muffin with a small amount of the 1/2 cup of leftover cheese on each egg muffin. Put the egg muffins in the oven and bake for 20-25 minutes or until the egg muffins are set in the middle and begin to turn golden brown. Remove from the oven and let cool before removing from the muffin tin. Once cooled off, remove from the muffin tins and serve with a dollop of sour cream, salsa, cilantro and green onions. Refrigerate the egg muffins for up to a week in an airtight container. If you want to freeze these, wrap them in plastic wrap individually and place into a large Ziploc bag. Remove from the freezer when you're ready to eat them and heat in a microwave for two minutes or until warm.